Clindamycin hydrochloride capsules are indicated in the treatment of serious infections caused by susceptible anaerobic bacteria. Clindamycin capsules are also indicated in the treatment of serious infections due to susceptible strains of streptococci, pneumococci and staphylococci. Its use should be reserved for penicillin-allergic patients or other patients for whom, in the judgement of the physician, a penicillin is inappropriate. Anaerobes Serious respiratory tract infections such as empyema, anaerobic pneumonitis and lung abscess; serious skin and skin structure infections; septicaemia; intra-abdominal infections such as peritonitis and intra-abdominal abscess (typically resulting from anaerobic organisms resident in the normal gastrointestinal tract); infections of the female pelvis and genital tract such as endometritis, non-gonococcal tubo-ovarian abscess, pelvic cellulitis and post-surgical vaginal cuff infection. Streptococci Serious respiratory tract infections; serious skin and skin structure infections, septicaemia. Staphylococci Serious respiratory tract infections; serious skin and skin structure infections; septicaemia; acute haematogenous osteomyelitis. Pneumococci Serious respiratory tract infections. Adjunctive Therapy In the surgical treatment of chronic bone and joint infections due to susceptible organisms. Indicated surgical procedures should be performed in conjunction with antibiotic therapy. Bacteriological studies should be performed to determine the causative organisms and their susceptibility to clindamycin. 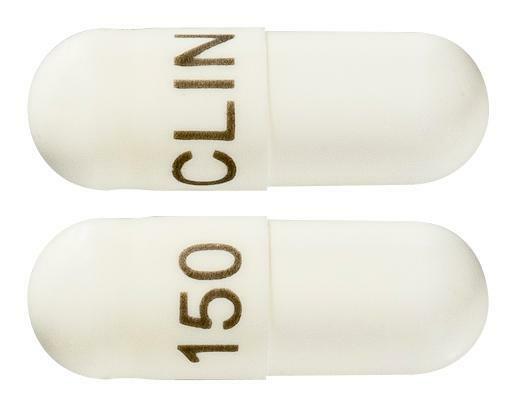 A hard gelatin capsule, size 1 white/white containing white crystalline powder, with marking "CLIN 150"
Septic arthritis occurs as a result of bacterial infection or immune suppression. It mainly affects young children and the elderly.